No matter whether you’re building a new bridge on the Ohio Turnpike or pouring basement walls for a single-family residence, Kuhlman Corporation has a concrete forming system to meet your needs. When you combine Kuhlman’s knowledgeable sales force with the economy and efficiency of concrete forming systems designed and manufactured by industry leaders, you have an unbeatable combination. Our team will provide you with the right pre-engineered form system for your project, delivered complete and on time to the job site. Column forms — reusable and single use. Hardware and accessories for tilt-up panels. Kuhlman stocks concrete forms in downtown Toledo (Yard 1), suburban Toledo (Yard 4), and Akron. Steel-Ply is a productive, pre-engineered, reusable, factory-built concrete forming system available for purchase or lease. Steel-Ply is designed for maximum versatility. It can be used to form virtually any kind of concrete pedestal, culvert, haunch or stoop, as well as straight, curved, battered or “Y” walls. Practically any dimension can be formed by combining panel or filler sizes and using them vertically or horizontally. The Steel-Ply system combines heavy-duty steel rails and cross-members with Symons special layup ½-inch HDO plywood for a 1000 psf rating at a 2:1 safety factor. 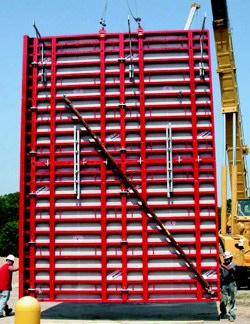 This load rating increases productivity and reduces tie requirements compared to typical job-built formwork. The Steel-Ply system consists of more than 80 standard panel and filler sizes. Wedge bolts connect panels, fillers and ties in one simple operation, making formwork erection and removal quick and easy. 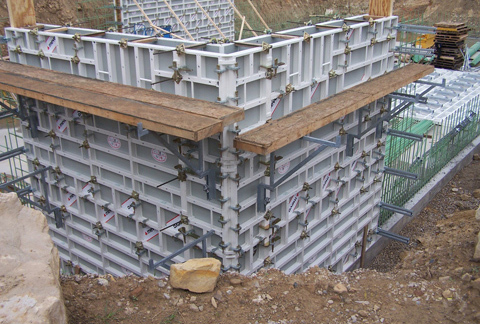 In addition to Steel-Ply, Kuhlman can provide the full-range of Symon’s other concrete forming systems, including Max-A-Form for pier caps/self-spanning applications and Versiform gangforming for large concrete walls. For more information on Symons concrete forming systems, click here. MevaLite is a modular, handset clamp concrete forming system available for purchase or lease. It is perfect for all contractors involved in commercial, industrial and highway projects. The revolutionary lightweight MevaLite system offers contractors and builders ultimate performance combined with easy set-up and take-down. Aluminum panel frames with white powder coating. Sizing in feet and inches. Two panel sizes: 4′ x 3′ and 6′ x 3′. Fast assembly with no nuts or bolts. Any tie system possible (taper ties, she-bolts, thru-rods). Easy attachment of any accessories. For more information on MevaLite forming systems, click here. Meva Imperial is a high-quality metric clamp system designed for heavy-duty industrial and infrastructure applications. It’s strong, unique and fast to assemble. Imperial is designed for safety and efficiency in large-scale vertical or horizontal applications. Large panel size of 12′ x 8′ = 96 sq. ft.
High pour rate is ideal for high walls. Designed for up to 2025 PSF. Alkus plastic face is strong and leaves a great finish. Can be screwed or nailed. Easy to stack and connect. For more information on Meva Imperial forming systems, click here. Western Forms is the world’s leading aluminum concrete form system for residential applications. Western Forms understands that each customer has different needs and expectations when it comes to forming. The partnership between Kuhlman and Western Forms allows contractors to choose the equipment that best meets their needs and budget. Product lines from Western Forms are designed with a “good-better-best” approach. No matter which system you choose, you still get a quality form with superior welding, construction, and performance. What started in 1955 as a form tie producer has grown into the nation’s leading manufacturer of aluminum forming systems for residential applications. Today, Western Forms delivers the highest-quality panels, hardware, tools and accessories. Plus, Western Forms continues to constantly improve its position as an industry leader through ongoing technological innovation. Western Forms was created to help contractors lower their costs and improve the quality of the structures they produce. Western Forms stands behind its products, its people, and its promise. 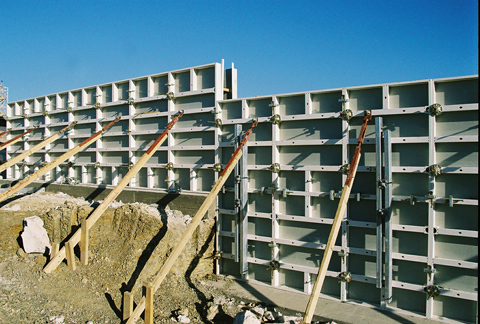 For more information on the complete line of concrete forming systems from Western Forms available through Kuhlman Corporation, click here. Formliners attached to the inside face of vertical concrete forms can impart an incredible variety of patterned architectural surface treatments. Formliners from Dayton Superior, Greenstreak or Custom Rock are the clear choice for texturing tilt-up, cast-in-place and pre-cast concrete. Architectural formliners are the perfect answer for sound walls, bridges, retaining/guard walls, signs, tilt-up buildings and wherever the combination of beautiful textures and the strength and durability of concrete is essential. Using state-of-the-art computer technology and equipment, Kuhlman can create almost any concrete form liner, pattern, image or logo imaginable. Whether it’s a standard pattern or a one-of-a-kind design, Kuhlman can help you make a great impression on your next project. For more information on Dayton Superior formliners, click here. 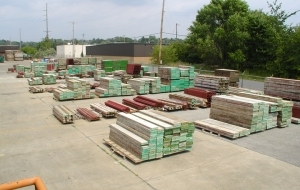 Contractors look to Kuhlman for their concrete forming needs because of our knowledgeable people, years of experience and extensive inventory of forms and accessories from leading manufacturers. For immediate assistance, contact us at 419/897-6000 or 1-800/669-3309 or phone a Kuhlman stocking location. Toledo-Yard 1: 444 Kuhlman Drive, Toledo, OH. Phone 419/321-1670. Toledo-Yard 4: 3038 N. Reynolds Road, Toledo, OH. Phone 419/531-2613. Akron: 999 Swartz Road, Akron, OH. Phone 330/724-9900. For all your concrete forming needs, specify Kuhlman for value, quality and service.